If you’ve been waiting not so patiently for the premiere of Graceland, then you aren’t alone! The brand new USA Network series is finally airing tonight after being held back for a year. What should be considered the grittiest series from the network so far, the new drama gives a glimpse into the life of top agents of the DEA, FBI, and Customs going undercover on a beachfront in Southern California. Unofficially known as Graceland, the secrets and lies that surround the city are nothing compared to what lies within the house itself. 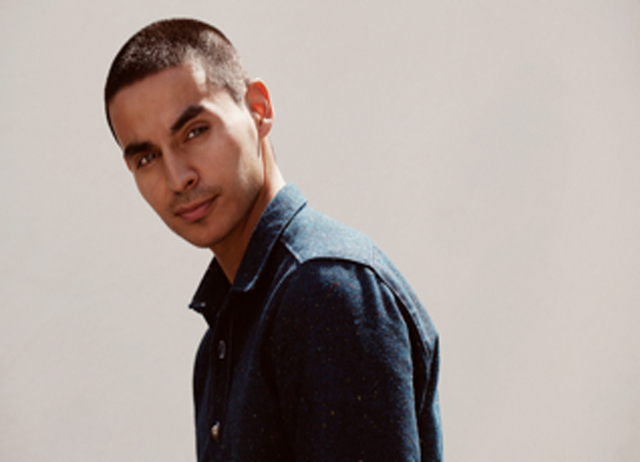 Starring Aaron Tveit as Mike Warren portraying the fresh face cop and Daniel Sunjata as his superior, we recently chatted with Manny Montana who rounds out the cast of characters as the comedic relief (for now). The twists and turns may catch your attention from the start, but the huge shocker in the very last scene of the pilot will make you realize that there’s a lot more to Graceland than you first anticipated. Finally, this show is premiering! The show has been holding off for a year. MANNY MONTANA: That’s so funny that you asked about that because I talking about that last night. It’s been like a year long process of waiting. We did the pilot in March, right up to a year now. There’s been a lot of anticipation because you know when you do something that you’re really proud of you want people to respond to it and you want to see if you are going to go for another season. So it’s been a little hectic but with all the promotion it’s been a lot of fun. Graceland is a real place. Is there anything else about the series that is based off reality? Only the house name is the true story. It actually housed agents there from like 1993 up to 2003, or something like that. So in that sense its true. It’s a real surprise on why it didn’t work out. There was so much drama in the house. So much of it is just so far-fetched. Your character Johnny seems like the comic relief, but like everyone else, it definitely seems like he has his own secrets. Johnny in the pilot—he comes off as kind of the relief and he goes out and helps with the chasings, but honestly he’s so much more than that. He’s the heart of the house. He wants everyone to get along. In Episode 3 or 4 he goes undercover and he starts getting into people’s drama with like Charlie and Mike. With the more people lying to him he starts getting into it with them. Its like a brother and sister fight. You’re going to fight and argue and say a lot of mean things but at the end of the day you love each other. There are so many twists and turns just from watching the pilot. How will the biggest secret revealed at the last scene of the episode translate throughout the season? Every episode it just changes! [Laughs] We get new scripts and we’ll be like, ‘Are you f-cking serious?’ It made us even prouder of the show though because everyone who’s seen the pilot or people [in the media] who have seen a couple of episodes are asking for the twists and turns as well. And we keep telling them you have no idea. It doesn’t even start twisting and turning until after 5 or 6. It just gets way deeper. It’s so dramatic. No other disrespect to other cop shows out there but come on. Everything is wrapped up at the end of the day and there’s always this elaborate crime in 30 minutes. Our show is much more serialized. You have to watch like Episode 2 to see what happens in Episode 5 or 6. That’s when you know you may just have a hit. When even the cast is shocked during the table reads. We have this text party line with the whole cast. [Laughs] We are always texting each other just so everyone knows what’s going on. First off, we just love each other. We are always texting each other like, ‘Did you see what happened in this?’ ‘Yeah, did you see what your character is doing?’ It’s just fun.